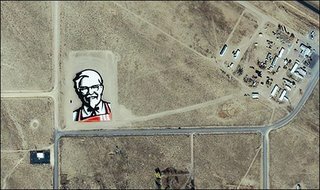 "KFC has the honor to be the first brand to be visible from outer-space, according to company officials. The 87,500 square feet logo was created by tiles placed in the Nevada desert, near the super secret Area 51. The stunt marks the revamp of the KFC logo, which now features a more streamlined image of Colonel Sanders."